This article is about the mid twentieth century actor. For his son, see Ed Begley Jr.
Edward James "Ed" Begley, Sr. (25 March 1901 – 28 April 1970) was an American actor of theatre, radio, film, and television. Begley was born in Hartford, Connecticut, the son of Hannah (née Clifford) and Michael Joseph Begley, Irish immigrants. After he dropped out of school as a fifth-grader, Begley ran away from home several times, going to work for "carnivals, fairs, and small circuses." Later he sold brushes, delivered milk and served in the United States Navy. 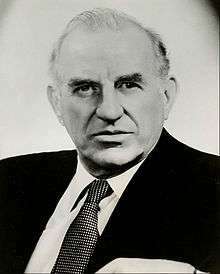 Begley began his career as a Broadway and radio actor while in his teens. He appeared in the hit musical Going Up on Broadway in 1917 and in London the next year. He later acted in roles as Sgt. O'Hara in the radio show The Fat Man. His radio work included Stroke of Fate and a period as Charlie Chan among other roles. He also starred in the 1950s radio program Richard Diamond, Private Detective, playing Lieutenant Walter Levinson, head of homicide at the 5th Precinct, Manhattan. He was elected a member of The Lambs in 1943. In the late 1940s, he began appearing regularly in supporting film roles. Begley (right) with Monte Markham in 1969. In the 1952–1953 television season, Begley co-starred with Eddie Albert in the CBS sitcom Leave It to Larry. Begley, though only five years older than Albert, played the father-in-law and employer of Albert's character, Larry Tucker, a shoe salesman, who with his young family lives with Begley. In 1954 Begley starred in the NBC Television show, Robert Montgomery Presents, in an episode sponsored by Lucky Strike called Big Boy as Joe Grant, an engineer for the Union Pacific Railroad living in Cheyenne, Wyoming, who worked on the famous Union Pacific Big Boy steam locomotives. The show is about how Begley's character copes with the transition from steam locomotives to diesel locomotives in the 1950s. He won the Academy Award for Best Supporting Actor for his role in Sweet Bird of Youth (1962). Some of his other notable films include 12 Angry Men (1957) as juror #10, The Unsinkable Molly Brown (1964), and Wild in the Streets (1968). One notable role Begley played both on television (twice in 1955) and in the theatrical film (1956) is William (Bill) Briggs, one of the three primary characters in Rod Serling's Patterns. In 1956, he appeared in the Broadway production of Inherit the Wind, in the role of Matthew Harrison Brady. For this performance, he won the Tony Award for Best Featured Actor in a Play. His other television work included appearances on Justice, Empire, The Virginian, Bonanza, The Fugitive, Target: The Corruptors, The Invaders, The Wild Wild West, and Going My Way, with Gene Kelly. Begley married three times. He is the father of the actor and environmental advocate Ed Begley, Jr. Among his many Broadway credits were All My Sons and Our Town. Begley died of a heart attack in Hollywood, California. He is buried at the San Fernando Mission Cemetery in Mission Hills, California. 1947 The Adventures of Philip Marlowe "The Friend From Detroit"
1952 Tales of the Texas Rangers "Birds of a Feather"
↑ Obituary Variety, 6 May 1970. 1 2 "Ed Begley Loves Life". The Bridgeport Post. 24 April 1964. p. 21. Retrieved 25 April 2015 – via Newspapers.com. ↑ "Ed Begley". Internet Broadway Database. The Broadway League. Retrieved 4 July 2015. ↑ "Inherit the Wind". Internet Broadway Database. The Broadway League. Retrieved 4 July 2015. ↑ Dunning, John (1998). On the Air: The Encyclopedia of Old-Time Radio. Oxford University Press. ISBN 978-0-19-507678-3. p. 149. ↑ Old Time Radio Westerns—radio shows Begley appeared in.